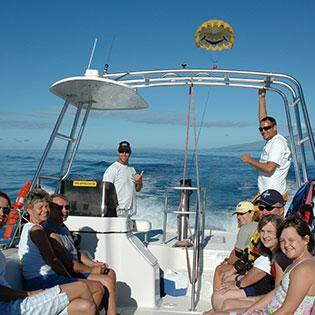 West Maui Parasail has been combining superior services with spectacular views for over 20 years. 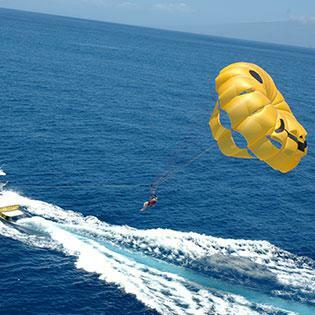 Operating out of two locations, slip 15 the Lahaina Harbor and by the Hyatt Regency on Kaanapali Beach, state of the art winch boats with custom-designed parachutes provide safe and easy takeoffs and landings rights from the boat. These boats are the most high tech in the industry and can carry up to 12 passengers with two different flights – tandem or single. Because there is no experience necessary, all ages are welcome to experience this incredible high-flying fun. The skilled and professional staff provides an effortless thrill ride, complete with a photographer onboard to capture photos of the memories that will last a lifetime. 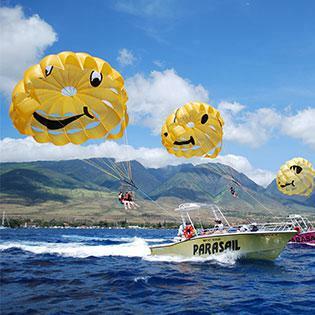 Passengers are offered two choices on their adventure with West Maui Parasailing: staying dry, or an exhilarating and refreshing ocean dip from toe to knee, known as the “touch ’n go.” With West Maui Parasail, you will have the experience of a lifetime. For reservations at either of our beautiful locations at Lahaina or Kaanapali, please call 808-661-4060. 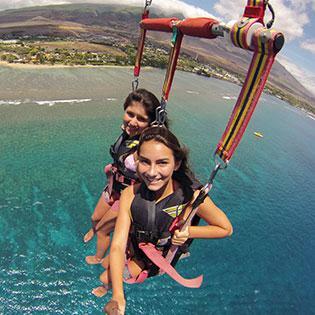 Soar up, up, and away with West Maui Parasail!